Put Diesel in your petrol car? Put Petrol in your diesel car? Don't panic we can help, we provide a Fuel Doctor in Manchester & Greater Manchester that can be with you within the hour!. Phil is our main man covering the Greater Manchester, he has extensive knowledge of providing mobile fuel drains along with extracting diesel from a petrol engine and petrol from a diesel engine. A local Manchester lad with a passion for motorsports, he will make sure you are back on your feet in no time. ​" I was heading into Manchester town centre for a family day out with the kids and called into the petrol station on Oldham Road, we was in a rush as the kids were getting hungry and without realising i was putting diesel into my petrol car. To be honest i didn't think i would have any issues until 5 minutes into my Journey my car started to jump, i knew straight away and parked up within Manchester city centre. I Googled wrong fuel in my car and Fuel Doctor Manchester caught my eye straight away, i gave them a call and they was at my service within the hour. The service from Fuel Doctor Manchester was paramount, i had 3 screaming kids, parked on double yellow lines and i was panicking. The service from Fuel Doctor was unbelievable... Well done "
" Travelling to Manchester City Centre in the early morning rush can be tough especially if you are already late for work. I had 3 miles left in my tank and i needed to fuel up. I pulled up at the next available petrol station on Ashton Old Road and fuelled my Vauxhall Vectra with the wrong fuel, i used Diesel instead of Petrol. I searched on my phone for Mobile Fuel Drain Manchester and Fuel Doctor Manchester was top of the list. I rang Fuel Doctor and they was working on my car within the hour. I didn't think that there was such a service but will definitely recommend Fuel Doctor to my friends and colleagues. 5 Star service with a smile. Great work guys "
" As a family we do our weekly shop on the weekend at our local food store just off Alan Turing Way Manchester. We used the stores branded petrol station and put Diesel in my Petrol car. It was an easy mistake to make as i drive my works van through the week which takes diesel and i endlessly use the Diesel pump. Ive heard of these guys before and that there service was second to none. I gave them a call and was at my side in under 45 minutes, the Fuel Doctor was very helpful and reassured me that everything was ok and no damage was caused. He quickly drained the existing fuel from my car and refuelled me with the correct fuel and i was able to carry on with my day as planned within 15 minutes of being rescued by Fuel Doctor Manchester. Great clean service, thanks Fuel Doctor Manchetser "
" Putting the wrong fuel in my car was the last think i needed, i was meeting a potential client and was already running late. I turned into the next available petrol station on Wilmslow Road Manchester for fuel and refreshments and unknowingly fuelled up my VW Golf with Petrol instead of Diesel. This was the last thing i needed on this particular day. I quickly searched the internet for Wrong Fuel In My Car Manchester, I rang them straight away as they offered a 1hr call out service which i thought was really quick. Fuel Doctor Manchester was at my service within no time, getting me back on the road in no tome at all. 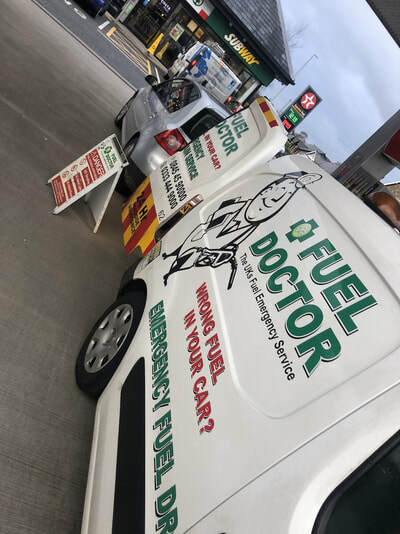 These guys are really good at what they do... Unbelievable service with a smile "
No matter where you are in Greater Manchester, we have a Fuel Doctor near you. We will be with you within the hour and with you for around 15 minutes. Don't panic, just call us. Everyday roughly 20 people put the wrong fuel in their car in Manchester, whether its diesel in petrol or petrol in diesel. It's a very common mistake and easily done, we understand that you need us there fast and to get back on your feet to get on with you life. 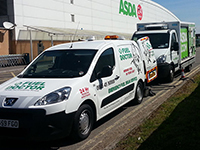 Fuel Doctor are a national company with technicians in Manchester. 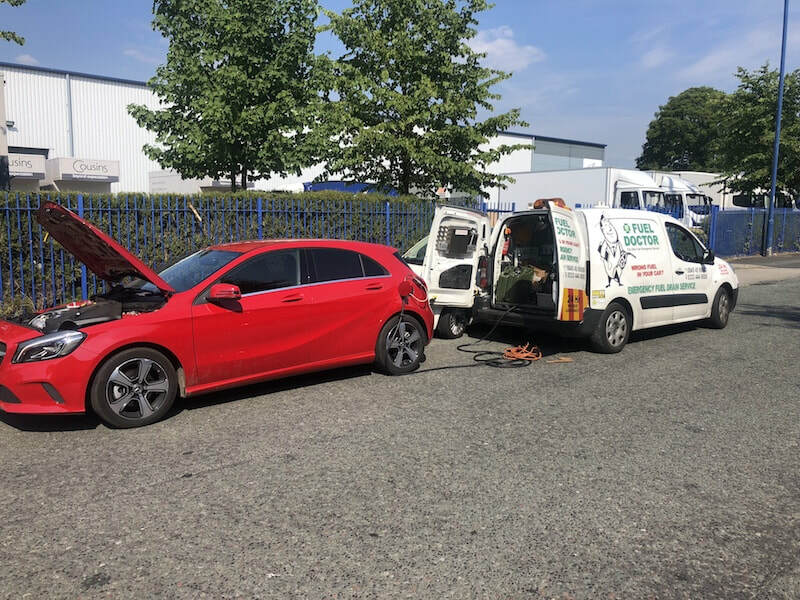 If you have put the wrong petrol in your car you can call us anytime of the day and you will have a dedicated local Manchester Fuel Doctor to get you back up and running. 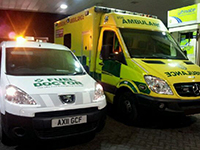 Emergency ambulance, Ashton under Lyne/Stockport, 80 ltrs petrol in a diesel, not started. Tired night shift filling up for next crew after a very busy shift only realised what she had done when she went to pay. So, this goes to show that even the brightest can have a moment and put the wrong fuel in their car in Manchester and Stockport and this is where we are on hand as an emergency service to help the emergency service. 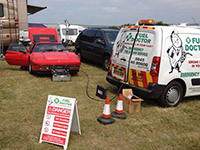 We also help out a lot of commercial clients, as we know if their cars are not running, then business will suffer, so why not speak to us about our commercial packages and view some of our commercial customers and partners. This customer called at the local petrol station on his way to Halfords in Altrincham and put unleaded petrol in his Diesel Mercedes C220 petrol and stalled in the Halfords carpark. He was very embarrassed but our technician of course assured him that it is more common that he would realise. We had him back up and running in 40 minutes while he got what he needed in Halfords and could head home. Here a customer in Old Trafford near the Trafford Centre filled their VW Passat right to the top with unleaded petrol in the diesel car without realising and then drove off down towards Eccles. The customer realised their mistake as the car began to jolt backwards and forwards and the customer then decided to pull over and then called us out to recover and put the right fuel back in their car. We were there within the hour and drained the fuel from their engine and ran through the diesel too. The customer was most pleased that the ordeal was dealt with professionally and quickly. "Fuel Doctor are really a breath of fresh air!" ​This customer in Rochdale Greater Manchester filled his brand new Volkswagen Tiguan with petrol instead of Diesel at a filling station in his home town. Having very recently bought the vehicle he was still in the mindset of filling up with Petrol, very embarrassed and immediately realising his mistake he gave us Fuel Doctor a call. 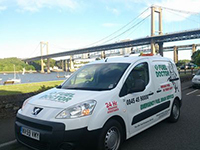 We were there within one hour to rectify his misfuel and the customer was delighted with the service. "You made my stupid mistake vanish as if by magic, thank you fuel doctor!" Mr Rutter of Hyde in Stockport put 55 litres of Diesel in his Petrol Nissan skyline GTR, it cut out on the main road and we recovered it to local garage. He was back on the road within the hour. Miss Roberts of Altrincham Manchester put petrol in her diesel car at the fuel station around the corner from her house, she just about managed to make it home onto her drive before it conked out. ​We drained and cleaned the engine and had her back on the road within the hour. This customer from M&Y Maintenance and Construction put petrol in his Diesel Peugeot Bipper panel van on the Shell garage forecourt in Standish, Wigan, Greater Manchester. He was back to work in no time at all! ​This customer put Diesel in her Petrol Citroën C1, Roadside assistance attended for Greenflag in Pemberton near Wigan. The engine had not been run so it was an easy job. ​She was back on the road within the hour. Mr Lawrence put a full tank Diesel into a Petrol driven Peugeot 107 at Morrisons in Hyde Stockport, he had started the engine and it cut out. Miss Howe put diesel in her petrol Citroen C1 and did not realise until the vehicle cut out at side of road in Cheadle, Stockport. Fuel Doctor Manchester got out to her in Cheadle and got her back on her way within the hour. Mr Robertson put Petrol in his Diesel Kia Ceed, and the engine had been run. There was a quarter of a tank of petrol remaining in the car and he had topped up with diesel. He drove 10 miles to B and Q Trafford Park and the vehicle would not start, so he called Fuel Doctor Manchester. We were with him within the hour drained and cleaned the engine and had him back on the road in no time. Mr Potter put Petrol into his Diesel Skoda Octavia in Cheadle, Stockport and drove home. He realised his mistake when he arrived home and had made it without stalling. Since the engine had been ru though, we had to drain and clean the system. Our Manchester Fuel Doctor did this and he was back on the road within 90 minutes. Mr Wilson out a full tank of petrol in diesel car at a filling station on the outskirts of Manchester Town centre. He had driven about 1 mile before his car stalled in a residential area. ​We made it out to him, drained the fuel cleaned the system, re-fuelled him and had him back on the road within 45 minutes. ​Mr Warrington put a full tank of petrol in his diesel Hyundai i40 at the Morrisons filling station in Heywood. He immediately realised his mistake and did not run the car. He called Fuel Doctor Manchester, we made it out to him, had the fuel drained and had him back on the road within the hour! Mr Robson put 40 litres of diesel into his petrol Vauxhall Mokka at a filling station in Middleton and drove about a mile. Heading towards his home he realised his mistake when the car stalled. He called Fuel Doctor Manchester, we made it out to him, cleaned his system, drained the fuel and had him heading home within 45 minutes. Miss Howe put Diesel in her Petrol Citroen C1 and did not realise till it cut out at the side of road in Cheadle, Stockport on her way back home from the filling station. Fuel Doctor Manchester got out to her at the scene, and had her back on her way within the hour. Mr Wong put petrol into his Diesel VW Passat and drove home to Cheadle, Stockport. He realised his mistake about 10 minutes from hoe when his car stalled. He called out Fuel Doctor Manchester and he was on his way within 90mins. Mr Coleman filled his Vauxhall Insignia with petrol instead of diesel at Tesco, Stockport. He didn't get very far and realised his mistake when the car started to judder. We were there in 45 minutes and had him back on the road in 30 minutes. 80 litres of Petrol into a Diesel engine brought the vehicle to a halt. After the Campervans breakdown assistance realised what the problem was they recommended the customer called Fuel Doctor. The European trip was soon underway again much to the relief of the flustered owner. Wrong Fuel, VW Golf, Clitheroe.